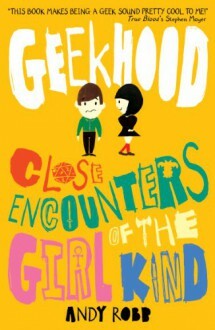 "Geek meets Girl... what could possibly go right?" Said without the slightest trace of irony, I might add. I first heard about this series while attending an event at a book festival. Andy Robb did a reading from the sequel: Mission Improbable, and after finishing this I'm happy to report that the piss-your-pants-laughing passage I heard was an accurate sample of his writing. Archie's voices (because there are several of them) are hilarious, mostly about the way they offset one another. On its own, Archie's self-depicting Exterior Thoughts, or his snarky Inner Monologue, would have been too bland or too annoying, respectively, and would have been testing their welcome really fast. Together? They take over the world! Seriously, did you not see the title of this post? Yes, underneath Archie's suave (read: self-depicting) exterior lies a wounded heart of a boy whose parents have divorced and found new partners, and his cure apparently lies in the conquest of Sarah, aka the Beautiful Goth, aka the only girl who can really "see" Archie. What follows is a rom com coming-of-age with D&D thrown in, and if that doesn't get your gears turning, I don't know what will. What really clinched this one for me, though, wasn't Robb's style, or his story. It was Archie. Specifically, Archie's spiritual journey - through wanting Sarah because she's nice, to being embarrassed when his step-father seemingly makes it his business and tries to "help", to trying to de-geekify himself when Sarah gives him a pseudo-psychological book about getting in touch with his "psychic self", to swinging too far in the opposite direction, to all of it coming down to an embarrassing halt when Archie realizes that Sarah isn't put on this Earth for his own salvation/ personal pleasure. Andy Robb's female characters are NOT just plot devices and awards for the awkwardly cute hero. If I were a smoker, I'd be toking up now. Stepping away from the hyperbole for a moment, there's too much about MPDG and MPDG-subversion stories to cover here. But this book isn't a subversion. It's not a classical MPDG either. It's a book that happens to have a main character who sees everything as tropes and plot devices, and starts to slowly come out of it as time goes on. And that's really what makes it so good - Andy Robb isn't trying to Teach A Lesson about sexism and geekery and manic pixie dream girls (and, again, can we please start a petition to get people to reconsider using mental health terminology so carelessly? k tnx,) he's writing a story with no other agenda than be truthful and entertaining. Basically, it's awesome, and right now, it's also 99p on the UK Kindle. As far as deals go, you can't do better.